The "City of Eternal Spring," Cochabamba is the third largest city in Bolivia and is located in the Kjocha-Pampa valley in the Andes mountain range. The name comes from the Quechua words "qucha" which means "lake" and "pampa" meaning "open plain." Blessed with fertile, productive soils and a climate of perennially spring-like temperatures, Cochabamba is considered the agricultural center for Bolivia ("the nation’s granary") as well as one of its most economically and socially progressive cities. It is a melting pot of cultures and industries with its own abundant plate of attractions, activities and places of historic significance. 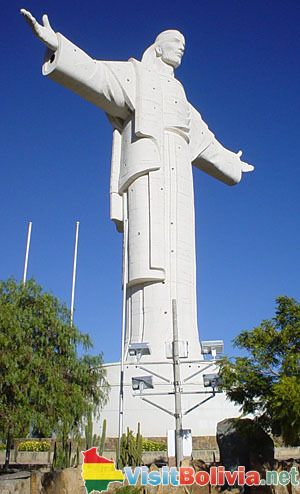 Aside from its active nightlife and breathtaking vistas, visitors to Cochabamba can check out interesting sights such as "El Cristo de la Concordia" on top of the San Pedro hill and is said to be taller than the Christ the Redeemer statue in Rio de Janeiro. There’s the Tunari National Park where outdoor activities like paragliding, trekking, climbing and bird watching tours can be arranged with local tour offices. La Cancha, South America’s biggest open-air market can also be found in the city. Palacio Portales located in the north side of Queru Queru was the opulent French-style mansion of Bolivia’s tin baron and wealthiest man Simon Patino, and is now an art museum and a cultural center. Well-preserved churches dating as far back as the 1500s can also be found in Cochabamba: the Main Plaza Cathedral depicts the fusion of Spanish Baroque and local “Cochabambino“ architectural style, and the Convento de San Francisco built in 1607 from rainforest wood and has an altar of gold leaf are just some noteworthy examples.